Lagos State boxing coach Babafemi Adefemi has predicted an easy win for Nigeria’s Ajose Olusegun in his WBC super lightweight elimination bout with Algeria’s Ali Chebah in the United States on September 30. Both Ajose (29-0, 14 KOs) rated No. 1 and Chebah (33-1, 26 KOs) rated No. 6 are making their debut in the United States fight arena and will need to impress ahead of a possible title challenge against champion Erik Morales. “Ajose will not break a sweat before eliminating Chebah in that fight. He’s fast, strong and determined to get that title and nothing will stop him,” Adefemi told our correspondent in Lagos on Tuesday. Adefemi added that the presence of veteran coach Joe Mensah would inspire Ajose to put up his best in the bout. “Mensah is a very experience coach. 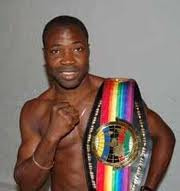 He can easily understand the opponent’s strategy and that will be useful for Ajose in the fight,” Adefemi said.